After sterilization, the cat needs to wear a blanket so she wouldn't raspisal remaining after the operation the stitches. Horsecloth cat walking on average 1-2 weeks, while the owners have from time to time to remove the blanket, to process the seams and then put on again. The problem is that veterinarians not always explain how to properly wear these clothes for cats. I put the blanket on the cat, be very careful. After the operation the animal feels not the best way, therefore, the faster and less painfully you will wear a blanket, the better. To suit a cat better together. First spread the blanket, straighten all the straps. Determine which side of the blanket should be tied around the head, and some near the tail. Make it easy: front drawstring located significantly further apart than the rear. Put the cat on the blanket. One person should hold the animal, and the second tying the blanket. Please note that the fabric must cover the body of the cat from the bottom, and tie – fixed on top. First, tie the two front straps over the animal's head, then take the second and third in a row of ties on each side (a second should be placed in front of the front paw and the third behind it) and tie the second left, the third right and second right third left. The blanket should be tightly encircle the torso, but in any case do not push. Pay attention to the cat's paws: they should move freely without getting tangled in any strings, or in cloth blankets. Further, the link between the fourth and fifth ties on each side (fourth fourth, fifth fifth). So you fix the blanket on the trunk. In the end it should be the last four straps – two on each side. Sixth tie should be placed in front of the rear paw, and the seventh followed her. Tie the hind legs as well as tied front, i.e. crosswise (left the sixth with the seventh right, right, sixth from the left seventh). The tail should be between the last right and last left plot. Check whether the bound hind legs, not to be confused with the drawstring or fabric. Finally, release the cat and let her walk a little around the apartment. Initially the cat will be uncomfortable to move, but eventually she will get used to the blanket. The blanket is designed to protect the animal from the cold. It absolutely does not exclude the fact that she can be beautiful and comfortable. The blanket does not restrict your pet's movements, does not hinder gait. It should protect the back, abdomen and chest cat. Sew it is usually made of several layers for warmth. You don't have a blanket for my cat? Sew it yourself. To sew the blanket for the cat, you will need top fabric, it performs rather decorative function, the middle layer – something woolen, warm, and bottom it will fit the body of a cat, and therefore should be pleasant to the touch (especially for hairless breeds), perfect flannel or Jersey. Measure your cat along the back from base of neck to beginning of tail. Draw the pattern in the form of a triangle whose sides are long enough to wrap the body of the cat and the median slightly longer than the distance from neck to tail. According to this pattern, cut all three fabrics and sew them in the order: underwear, insulation, decorative. If the poponku will dress up the cat in the offseason, you can do without the heater. Now do the in a corner from which you pulled the median for cutting, the hole for the tail. You can simply sew on to it the loop for the same purpose, but a blanket with a hole would be better to hide the cat. Treat the hole threads. Pull it through the hole the tail, the other two corners down along the front legs, then wrap the ends around the cat's body – care for their paws, and pull up before them, and not tie a very tight knot at the back. This is the easiest way to sew a blanket for the cat. You can do a little differently. To cut the fabric so that left the "front" corners, making the holes for the front paws. Sew all the layers in this pattern, and then evenly along the length of the product, to distribute fasteners that will attach the blanket on my stomach. It can be Velcro, ribbons, hooks and loops, buttons and so on. Buttons are not recommended as pretty easy cats. On average you will need 4-5 pairs of fastening at the neck, in front of the front legs, followed, in the middle of the abdomen, in front of the rear legs. Fasten the blanket on the cat not too tight and not too loose. Unfortunately, sometimes there are situations when is necessary surgery to save the life of your pet. Maybe order your pet is recovered quickly and didn't hurt the incision, he will need some time to wear a bandage. Can you sew it yourself? If cats had abdominal surgery, in some cases, a veterinarian will recommend the owner to purchase a special animal for post-operative bandage. Not so easy it can be to deal with the intricacies of fabric and ties, but make it still have. The main purpose of such rugs is to prevent dirt in the stitches, which can occur inflammation. Wearing blankets for cats for some time with a high degree of probability allow for normal fusion of tissues. How to sew a bandage for the cat yourself? 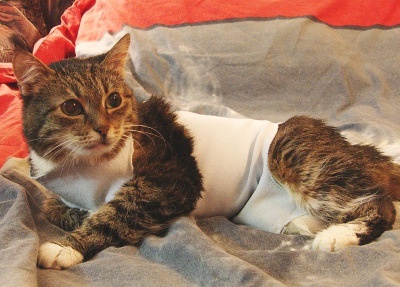 To manufacture post-operative bandage for cats are medium in size on their own, take a piece of thick cotton cloth, better light shades – they are more visible to potential contamination. Please note that the fabric should not be loose and "crumble" - trapped in the wound a small string can provoke the development of inflammation. When you do pattern blanket, don't forget to leave allowances for stitching its edges. To brace for a medium-sized cat will need a rectangle of fabric approximately 27 to 28 cm, at center rear edge of which is continued by the valve 8 cm long and 10 cm wide. Back 12 cm from the front edge of the future and make a blanket with both sides of the cut depth of about 9 cm and a width of 3-4 cm for the front legs of the animal. Sewn edge of the workpiece to prevent "shedding" of the fabric. To secure the bandage on the body of the cat should be firmly and neatly sew the workpiece tape. A pair of strips fastened on both sides of the tire close to its front edge, next – on both sides of the cutouts for the front legs and near the rear edge of the product. On the back of the valve at its edges sew 2 more strips you tie on the tail of the animal. The brace should snugly to the chest and tummy of a cat, and it strips you should tie on top, on her back. Tape, which the blanket is secured on the body of the animal, should not cause him discomfort and at the same time they should be sufficiently durable and safe. Do not make these straps too long, the animal may catch their all for something and panic. Ideally, they should be made of such material that in case of an emergency, the animal could break and release myself from the blanket. In fact, the first couple of days after surgery the cat better not to leave unattended. That's how much time you usually need for she ceased to feel the bandage on my body and not to disrupt it, risking to damage the seam and to bring him the infection. Don't forget to change the bandage – it should always be clean. Timely treat the incision area as instructed by a veterinarian. No need to fully remove the bandage for this treatment is enough to unleash the last couple of strips and bend the valve. A young and strong animal has a good ability to regenerate, and the seams have him heal very quickly.